Can I Do a 70.3 Triathlon? You might have a few sprint and Olympic-distance triathlons under your race belt and you're toying with the idea of doing a 70.3 triathlon this season. The idea floats in and out of your to-do list because of concerns. Admittedly, two big items you're worried about include the training time commitment and staying healthy. Compared to training for an Olympic-distance event, how much more time will it take to train for a 70.3 for a mid-pack racer? The swim distance in most Olympic triathlons is 0.9 miles. For a 70.3 race, it goes up to 1.2 miles. This 0.3 mile difference equates to 528 yards. For those that are concerned about more pool time, no worries because this increase in yardage won't take much—if any—increase in swim training time. Many experienced Olympic-distance triathletes are already doing 1.2 miles (2,212 yards) in one if not 2 to 3 workouts each week. Tip: If you are an experienced swimmer with a long history of swimming, you can easily cut the swim days to two, rather than three. If you swam competitively in high school or college, you can get by with two swim workouts per week totaling 2,500 to 3,000 yards. Your ride distance will more than double on race day, going from 24.8 miles in your Olympic event to 56 miles in the 70.3. Depending on the training plan you've been following, however, training time will likely not double. For example, one of the training strategies I use for some of my Olympic distance training plans is to schedule a few long bike workouts to prepare triathletes for overall race endurance. For a fit Olympic distance triathlete, this means 1 to 4 long bike rides around the 3-hour range. These rides fall within the last few weeks of training before volume tapers heading into race day. 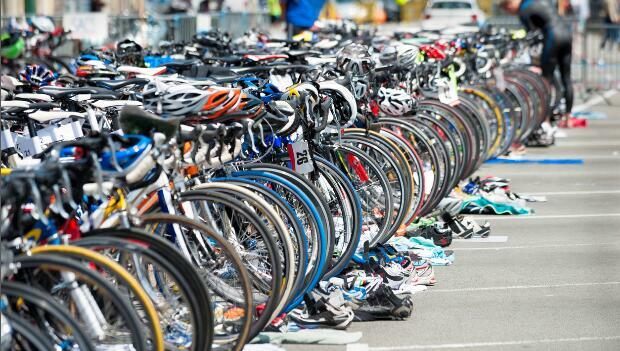 Tip: Triathletes that can complete 50- to 80-percent of the race distance in training, can be successful on race day. This means a long ride of 25 to 45 miles. If you have several weeks prior to the race, completing one to three rides in the 80- to 110-percent range (45 to 62 miles) will build deeper endurance fitness.